WhiteAzalea Bridesmaid Dresses: How to Choose Autumn Bridesmaid Dresses? How to Choose Autumn Bridesmaid Dresses? Careful consideration should be made when choosing bridesmaid dresses for your wedding. Take into account color, style and personal preference for you and your bridesmaids. 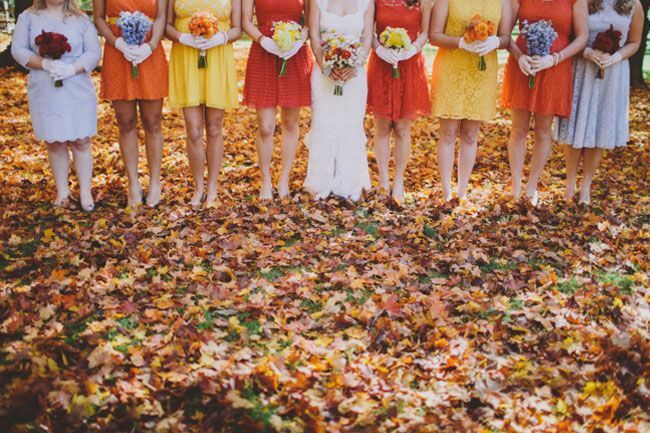 When planning an autumn wedding, use the tips below to find the right dresses for your bridesmaids. 1)Consider the weather. Depending on the geographic location of the wedding, fall temperatures are potentially much cooler than that of a June wedding. The weather in autumn can be sometimes unpredictable however. Try a lightweight fabric like silk, in a sleeveless style that works well with a shawl or wrap. 2)Match dresses to the flowers that are in season at the time, and the flowers you will be using. Darker tones look great in the fall season. Go for a rust color like the changing leaves or a deep candy apple red. 3)Choose a longer style for the bridesmaid's dresses if you are having a formal wedding. Tea length style dresses are lovely, but are maybe more appropriate for late spring or early summer weddings. 4)Find some fun accessories that are appropriate for autumn to wear with the dresses. A wrap is very versatile, as is a handbag. A scarf or muff should be reserved for winter, just as sandal shoes and flowers in hair should be saved for summer weddings. 5)Try a sleeved dress with cuffs. These are good choice for bridesmaids that are self conscious over bare skin. A sleeved style is perfect for cooler climates and fall temperatures. 6)Try a fun and current trend that can flatter bodies creating a waist by tying a sash of a different color at the waist. Try a bold color on a neutral dress.